The art of peace begins with a thoughtful sentiment, and this exquisite holiday card is one they'll never forget. 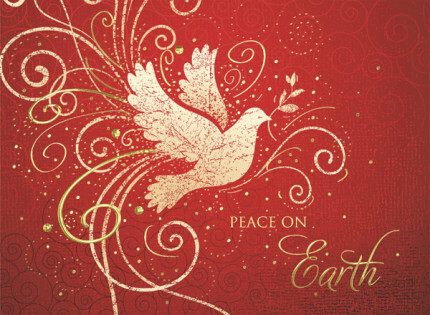 A dove and olive branch design above "Peace on Earth" is printed against a rich red background. The Art of Peace is a religious personalised Christmas cards which is finished with a shiny gold foil. CN2015 is suitable for business, corporate, company and personal use. The Art of Peace is supplied with a quality white insert which is personalised with your Christmas greetings.